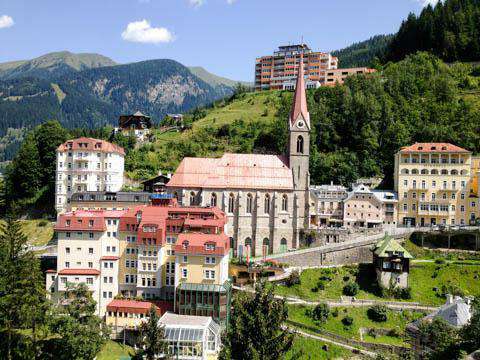 How much does it cost to travel to Bad Gastein? How much money will you need in Bad Gastein? €97 ($109) is the average daily price for traveling in Bad Gastein. The average price of food for one day is €28 ($31). The average price of a hotel for a couple is €99 ($111). Additional pricing is in the table below. These average travel prices have been collected from other travelers to help you plan your own travel budget. How expensive is Bad Gastein? Located in the High Tauern Mountains south of Salzburg, Bad Gastein is a spa and ski town known for hotels and villas built into steep and forested slopes. While the town is most visited in the winter for skiing purposes, it is also a home base for many hiking opportunities throughout the summer. Bad Gasteiner Wasserfall (Bad Gastein Waterfall) is a landmark of Bad Gastein, located in the center of town and plunging a total of 341 meters in three tiers down to the valley bottom. Along the Grabenbäckersteig and Wasserfallweg paths, visitors can view the waterfall from different perspectives. The Stubnerkogel Suspension Bridge is another main attraction in town. One hundred forty meters long at some 2,300 meters above sea level, the bridge leads to the Glocknerblick viewing platform and Felsenweg path and is open year-round. Then there are the spa locations that offer therapeutic treatments to all who visit. The Gastein Heilstollen Galleries, for example, contribute to health and energy from the depths of Bad Gastein's mountains. The unique healing climate at alpine elevations aids in the therapy of rheumatic conditions as well as aiding respiratory passages and skin. Felsentherme Gastein is another spa resort with different indoor and outdoor areas, featuring beauty and wellness treatments. The name "Bad" of Bad Gastein translates to "spa," reflecting the town's history as a health resort. Other attractions of the mountainous town include churches like the 14th century St. Nicholas' Church, the 19th century Preimskirche featuring baroque and Neo Gothic sculptures, and the "Maria vom Guten Rat" pilgrimage church in Böckstein. There are also a number of museums including the Gastein Museum which highlights the valley's hot springs, the history of the spa tradition, Gastein folk heritage, and a painting gallery. The Böckstein Mining Museum consists of an old salt warehouse and packhorse stable as well as an ore processing plant where visitors learn how gold-bearing ore is transformed into gold, while the Imhof Power Plant in Sportgastein displays models of machinery used during the gold-mining days. Uniquely built upon mountainous slopes, the town of Bad Gastein blends into the landscape that it inhabits. Nestled in a crook of mountain, it is a place of pure alpine air, tranquil hot springs, and charming "belle epoque" period architecture. Bad Gastein is an ideal home base for skiing in the winter with plenty of opportunity to enjoy the healing properties of the local thermal springs - some even feeding into hotel pools and spa resorts. In the summer season, Bad Gastein is a paradise of hiking paths, running and walking trails, as well as cycling and mountain biking tours. The nearby Hohe Tauern National Park is another locus for outdoor activity, especially for trekking in the summer and snow shoe hikes in the winter. Spa treatment in the area's thermal spring waters, hiking, and winter sports make up much of the activity there is to be had in Bad Gastein. The Bad Gastein and Bad Hofgastein ski resort is part of the larger Ski Amade network, a good location for skiing and snowboarding with plenty of chairlifts and gondolas. The town was also host to the 1958 World Championship in alpine skiing and is a regular scene of the snowboarding and boardercross world cup. The cuisine of Austria varies depending on the region; however, dishes are generally composed of influences from throughout the former Austro-Hungarian Empire. Regional differences are usually significant from nearby nations like Italy, Hungary, Bohemia, Germany, and the Balkans, which have had an effect on Austrian cooking. In the Austrian state of Salzburg, where Bad Gastein is located, some local specialties include a kind of cheese dumpling called Kasnocken, freshwater fish (especially trout), as well as a meringue-like local dessert called Salzburger Nockerl. Some of the town's best restaurants as rated on TripAdvisor include Restaurant Rossalm, The Blonde Beans, Ginger n' Gin, Wirtshaus Jagerhausl, Bellevue Alm Mutter aller Hutten, Ristorante Pizzeria Angelo, Steak and Mehr, Silver Bullet Bar, Orania Stuberl, and Alpenhaus Prossau. By plane, the best option is to fly to Salzburg, Munich, or Klagenfurt. From here, Bad Gastein can be reached by car or by train. There is a railway station in the center of Bad Gastein, where trains run approximately by every other hour. The main railway is the Tauern Railway, a major railroad running from Schwarzach-Sankt Veit in the north across the Alpine crest through the Tauern Tunnel to Spittal an der Drau, Carinthia in the south. Frequent EuroCity and InterCity trains going along this route connect Bad Gastein with a number of Austrian cities including Vienna, Linz, Salzburg, and Graz along a single circuit.